If there is one thing that my kids love to eat other than fried chicken and steak, it would be shrimps. Technically, they love prawns, because they love to eat what they call the “big shrimps”. During the holidays, they were treated to a seafood fest of tiger prawns via a seafood delivery made to my mom’s house a few days before Christmas. It came as a gift since my mom is now a pesco-vegetarian after battling with cancer a few months ago. She was gifted with a variety of seafoods including her favorite, scallops! She had the prawns cooked in different ways, kebab style and one fried with butter (my preference and favorite!). Suffice to say, even the pot roast was snobbed on Christmas Eve because of the prawns. 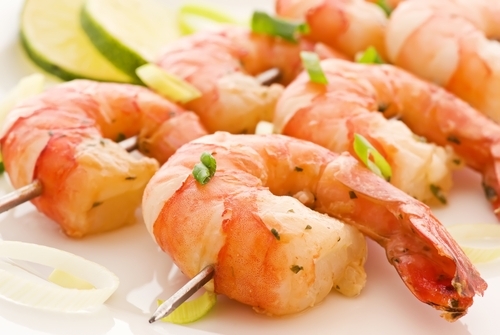 Rinse the prawns or shrimp under a cold running water and then pat dry with a paper towel. Melt some butter together with some olive oil in a large frying pan over a high heat. Add the prawns with a few cloves of chopped garlic. Season with salt and black pepper to taste. Fry the prawns, stirring frequently, for 3 – 5 minutes or longer for larger prawns, or until the shells have turned pink. This entry was posted in Family Cooking, Food Business by admin. Bookmark the permalink.